In this chapter, I introduce two key concepts: policy and power. My argument is simple. Our understanding of, and everyday response to, phenomena such as ‘disability’ or ‘poverty’ is profoundly shaped by values and beliefs brought to general acceptance by powerful social groups and actors. I should say immediately that I am not seeking to peddle any sort of ‘conspiracy theory’, nor am I proposing some simplistic account of rule by a privileged or malign élite. 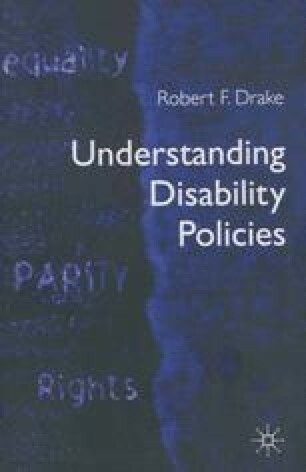 However, except in unusual circumstances, there are far more non-disabled people than disabled people in any given population, and there can be little surprise therefore that prevailing norms and values reflect the interests of the majority and may subordinate those of the minority. These same norms comprise the warp and woof of contemporary disability policies.